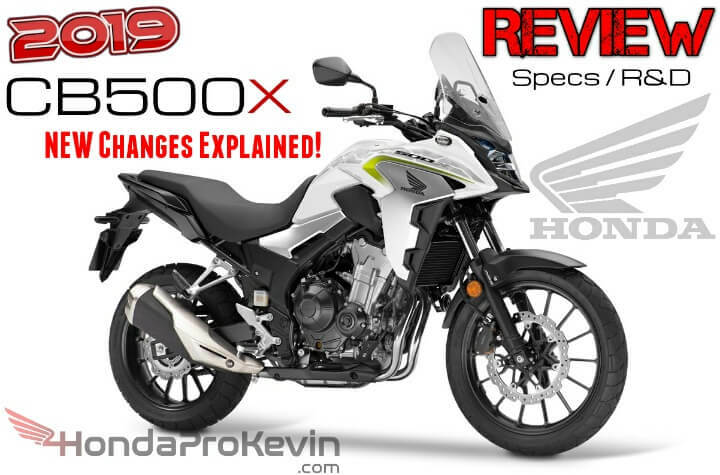 2019 Honda CB500X Review of Specs / Features + BIG NEW Changes Explained! 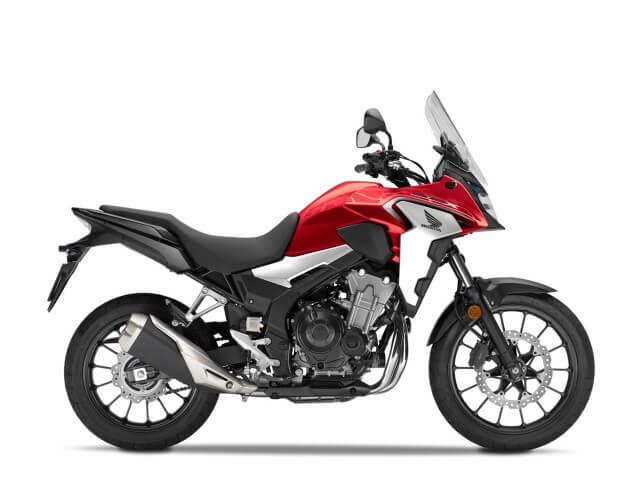 The 2019 CB500X adventure motorcycle is back and with a bang this year! 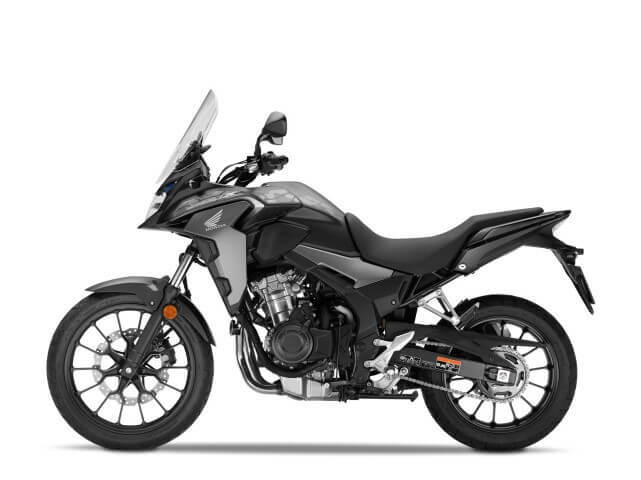 It’s not often we see changes made to a bike following the year after Honda already threw changes and upgrades its way but thankfully Honda wanted to step-it-up this year with the CB500X and not only that bike but also tweaks were made to the 2019 CBR500R and CB500F. 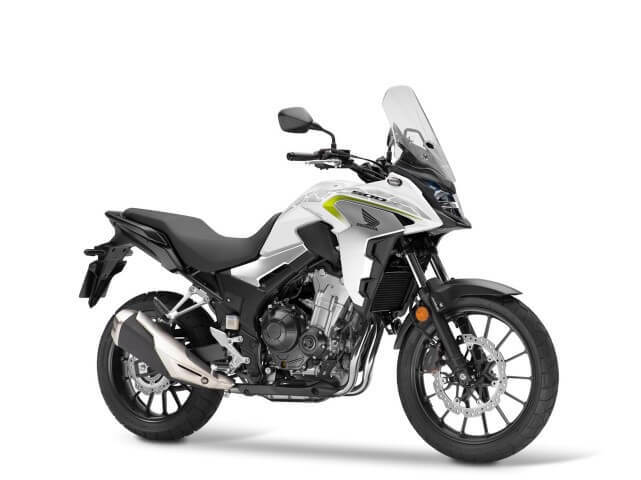 Check out the laundry list of new 2019 Motorcycles with changes and upgrades by Clicking Here. 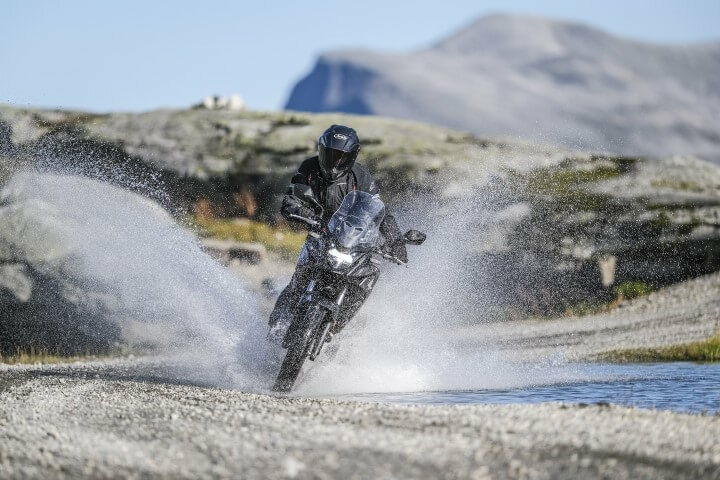 Nothing delivers the feeling of freedom like an adventure bike, and the new CB500X has significant performance upgrades that make it ready for adventure without losing any of its city manners. 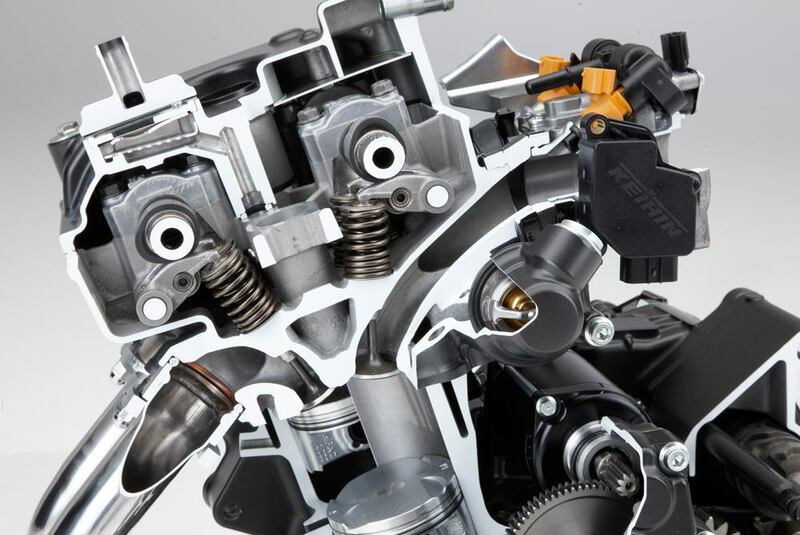 A completely revamped intake tract, new fuel-injection nozzles that concentrate their spray, improved cam timing and a new, more precise crank sensor add up to a 3 to 4% torque gain in the 3,000 to 7,000 RPM range of the 471cc DOHC, four-valve, parallel-twin engine. 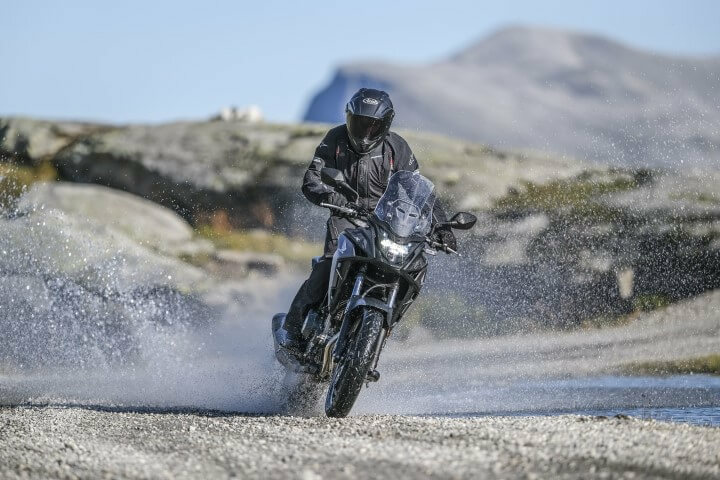 Power is tuned for strong low-end and precise throttle control, ideal for the unique needs of the rider who ventures where others turn back. 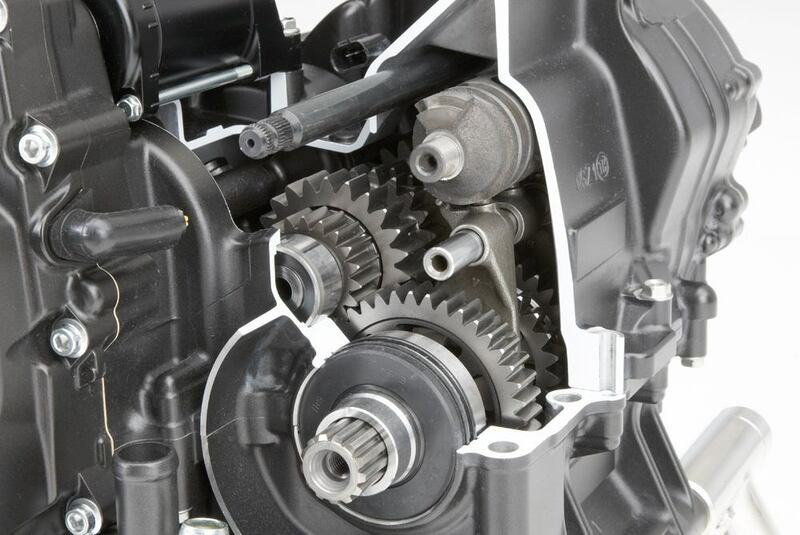 The new slipper clutch makes downshifts smother, and lever pull is 45% lighter. The front wheel is now 19 inches, improving bump absorption. A new rear shock, increased suspension travel front and rear, higher ground clearance and a new tapered handlebar combine to prepare this midsized machine for full-sized adventures, and a revised steering angle improves high speed cruising yet also allows a tighter turning radius. 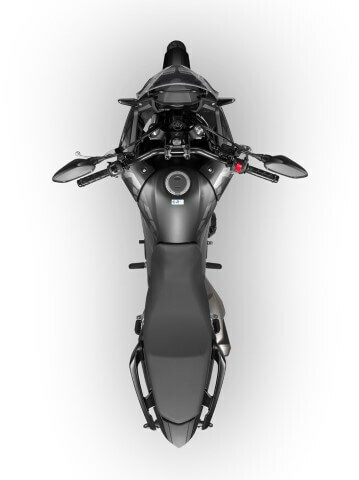 The rear brake has been redesigned for improved control, and ABS settings have been optimized. 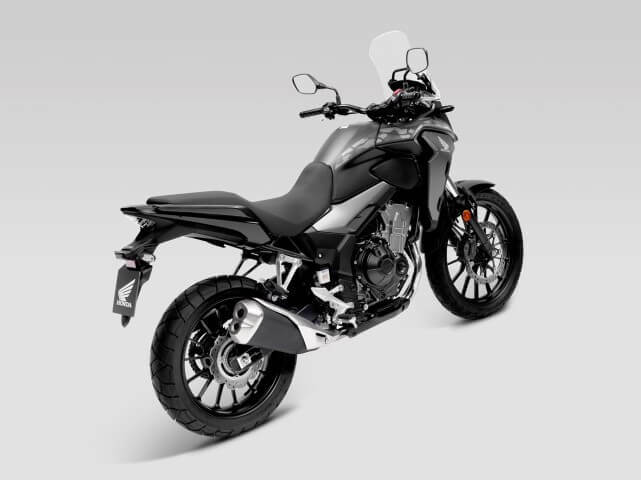 Rugged styling, a new multi-function display, a sportier exhaust note and the upright adventure riding position accentuate this machine’s intentions. 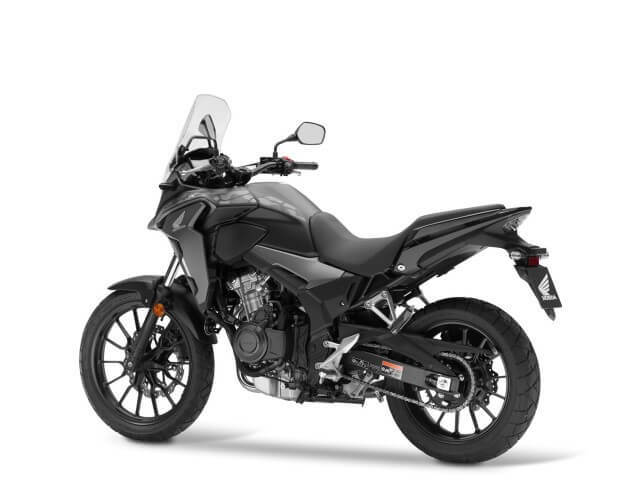 2019 CB500X VS 2018 CB500X Changes: Yes, I break down the details more in-depth below. Fuel-injector spray narrowed, fuel-droplet size optimized for improved spray penetration in intake. 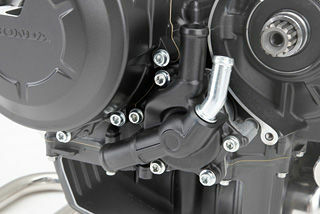 Improves combustion and therefore creates more linear power from first crack of the throttle through to rpm redline. New muffler with increased volume before and after catalytic converter. Backpressure optimized for improved low-end and midrange power. New dual-outlet muffler tip makes exhaust note racier-sounding to match new power. Larger, 19″ front wheel for better bump absorption, improved high-speed handling. Steering caster angle slackened by 1 degree (now 27.5 degrees) for improved handling. New front and rear tire design with deep-grooved tread. 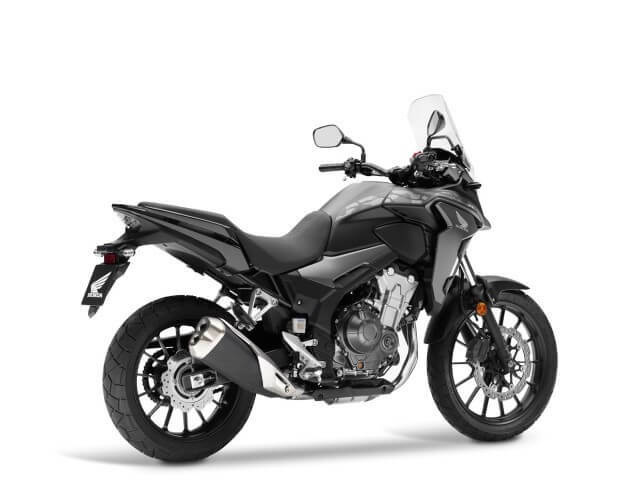 New shock with advanced pressure-separation design from Honda’s large sport models is more stable and predictable for improved rear-wheel tracking and traction. 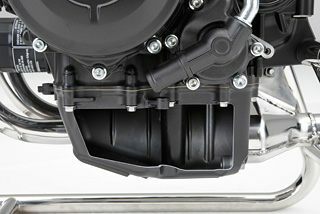 Increased suspension travel (up .4 in. in front, 1.2 in. rear) for improved performance through stroke, reduced bottoming and increased ground clearance. On ABS version, upgraded modulators improve precision during ABS engagement. Lighter seat rails for improved mass centralization and better handling. Turning radius reduced by nearly 8 inches for easier maneuvering. New tapered handlebar improves feedback, control and style, while new rubber-mounted handlebar clamp minimizes vibration to rider’s hands. More aggressive adventure styling with new fuel tank, radiator shroud, headlight, clear taillight lens and new LED turn signals. New shroud design helps direct radiator heat away from rider’s legs. 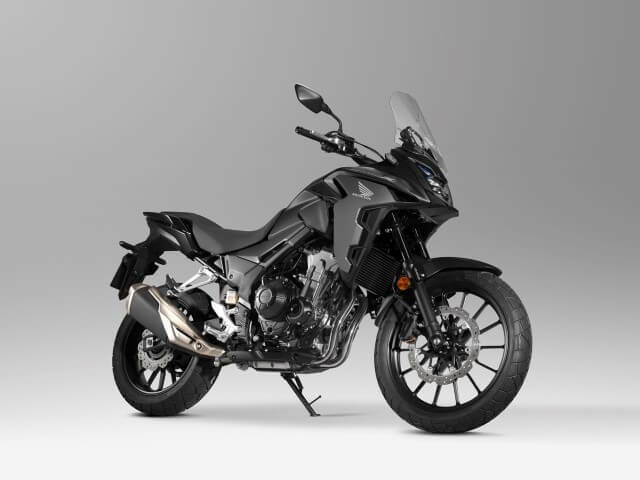 The CB500X – originally launched in 2013 alongside the naked CB500F StreetFighter and fully-faired CBR500R Sport Bike – brings crossover adventure style to Honda’s fun-focused twin-cylinder ‘light middleweight’ trio. 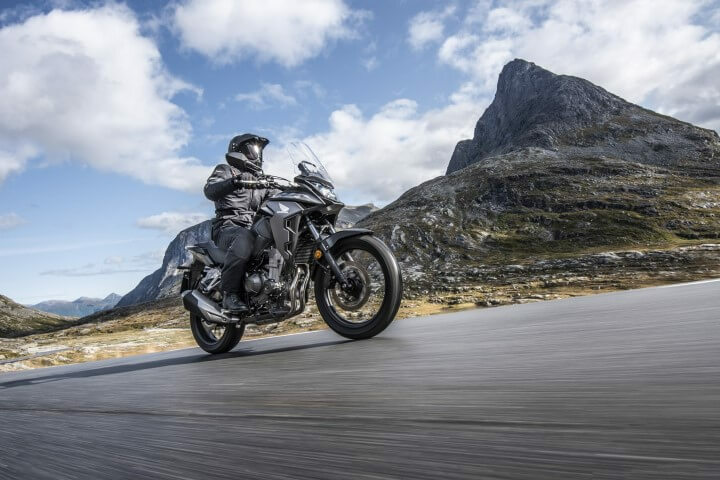 It is a motorcycle that, without fanfare, quietly gets on with the job of being supremely competent, and adaptable in use for a wide variety of owners. 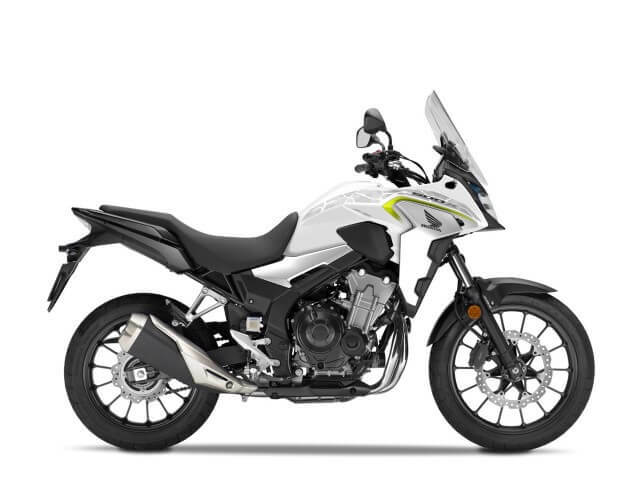 It slips between the role of short-hop commuter to weekend touring bike effortlessly. 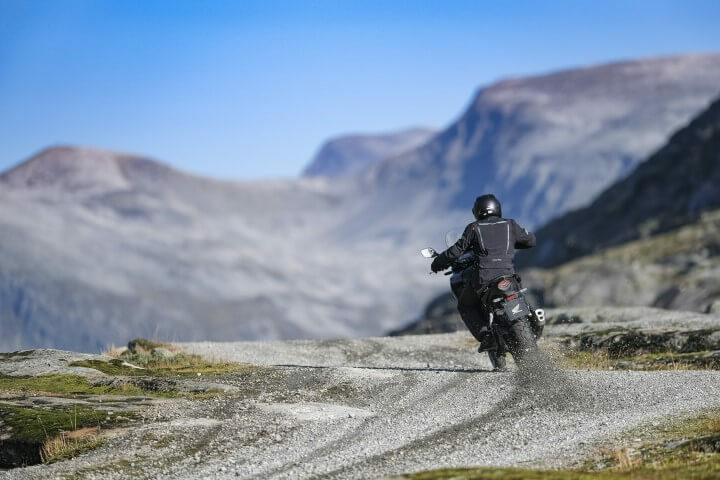 Long travel suspension irons out irregular road surfaces, wide handlebars provide leverage and the upright riding position offers both comfort and a wide field of view for the rider. 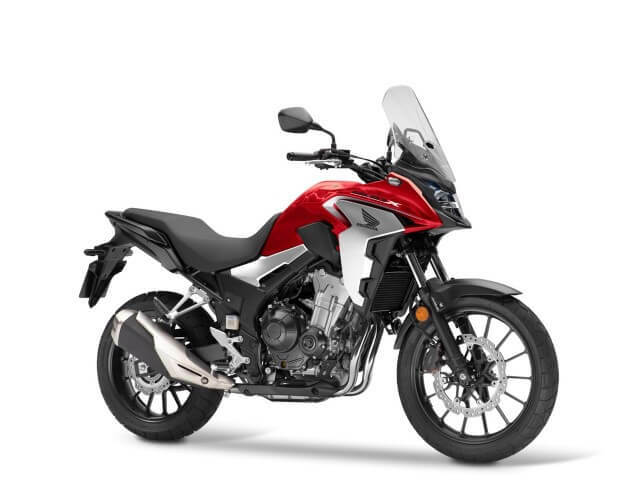 In other words, the CB500X has proved an all-rounder in every sense of the term. 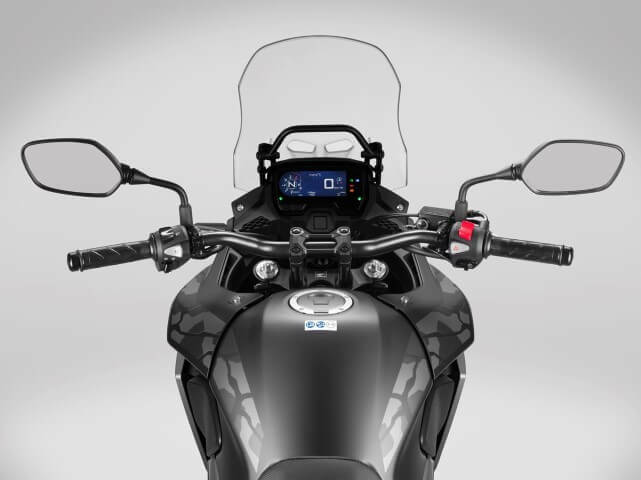 In 2016 (2017 for USA), a the first round of upgrades and changes saw the CB500X receive a larger fuel tank, more wind protection and a taller screen. 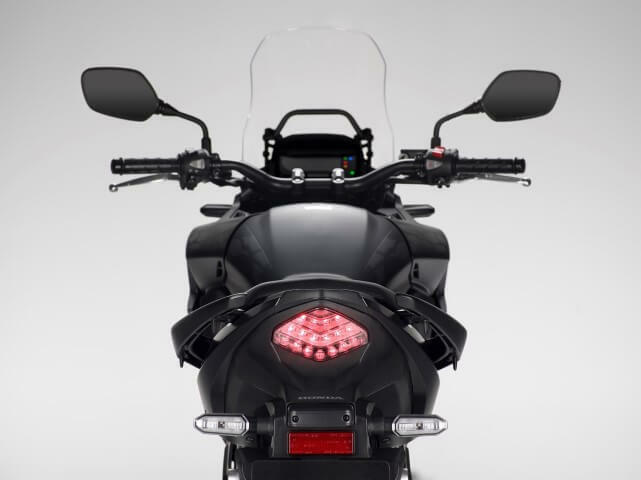 It also gained LED lighting, spring preload-adjustable front forks and an adjustable brake lever. 2019 brings a major evolution for the CB500X. 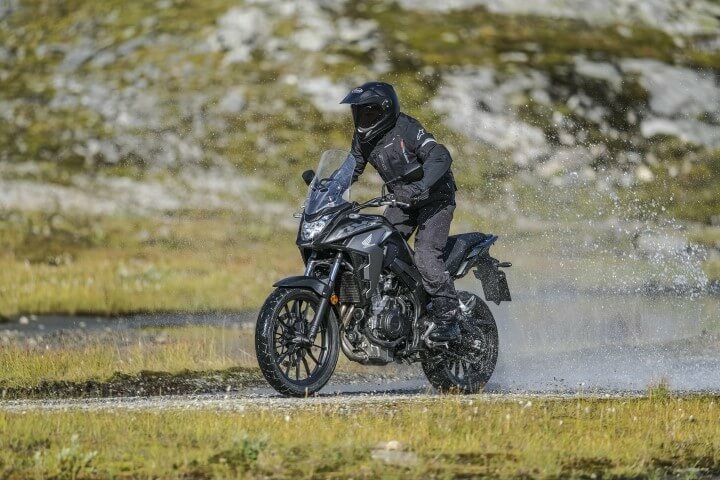 More sophisticated adventure style – that highlights and confirms the unique proposition it offers – plus more engine performance and a number of chassis upgrades ensure that while the new CB500X remains confident in its wide-ranging abilities, its ‘X’ factor has been amplified a good deal louder. 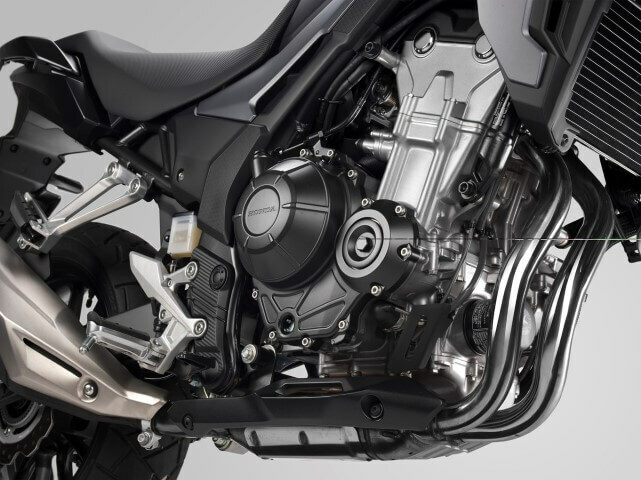 And while the CB500X’s engine maintains the 49.6 HP mark (35kW peak output required for A2 licence holders), it now makes 4% more power and torque between 3-7,000 RPM, thanks to revisions to the inlet, exhaust and valve timing. The new dual-exit exhaust muffler features an enhanced exhaust note and the engine now also features an assist/slipper clutch. 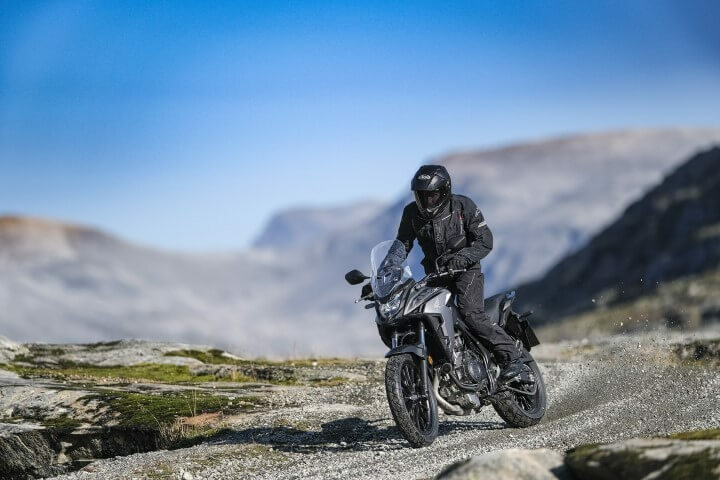 The 2019 CB500X has been reborn with a much more aggressive, ‘ready for the wild’ adventure style. 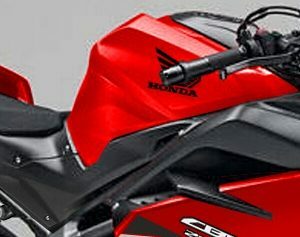 With the popular Africa Twin CRF1000L offering a guiding light, Honda’s development engineers have extended the radiator shrouds and fairing with substantive angles that give a strongly three dimensional texture and feel, while the fuel tank now interlocks with the side covers, cohesively linking the front and rear of the machine. 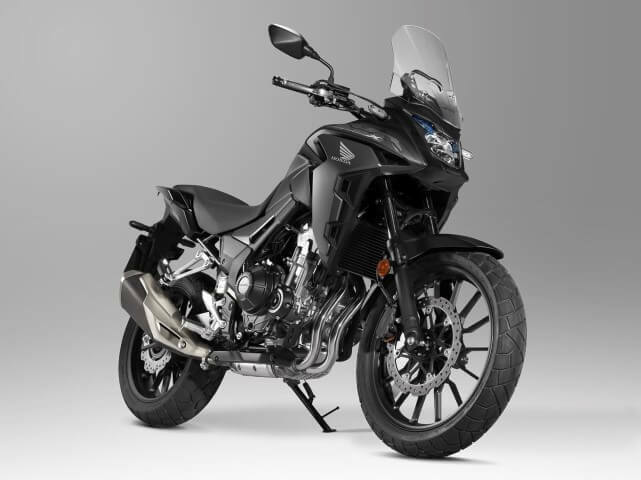 And while the CB500X styling may have come of age, its redesign is about much more than looks. 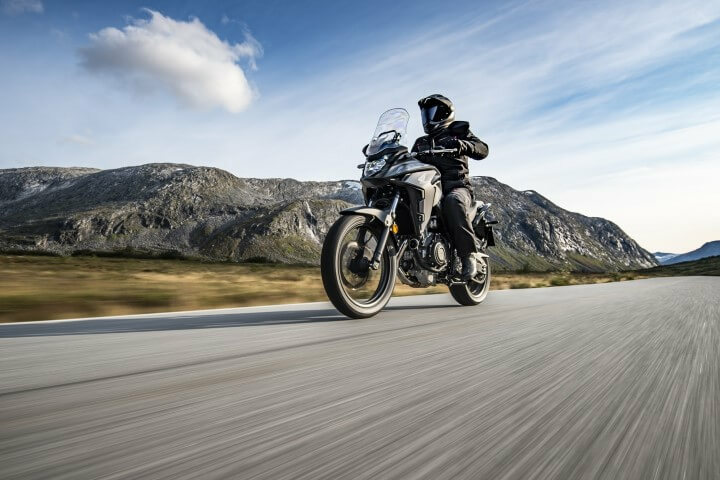 Thanks to improved aerodynamic performance, the high-pressure air flowing around the fairing and screen has been reduced, improving wind protection for the rider at highway speeds. The seat profile, too has been slimmed by shaving the shoulders at the front, allowing for easy movement around the machine, and aiding the already comfortable ground reach. 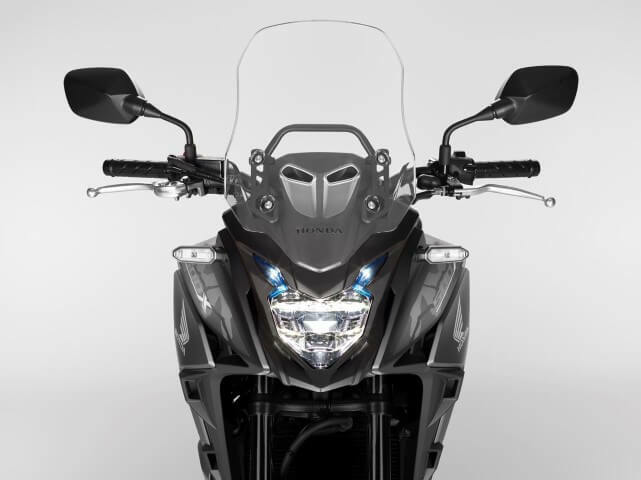 To help the CB500X’s maneuverability the steering angle has increased 3° to 38° from centered to full lock, and the addition of a gunmetal grey tapered steel handlebar further aids control. 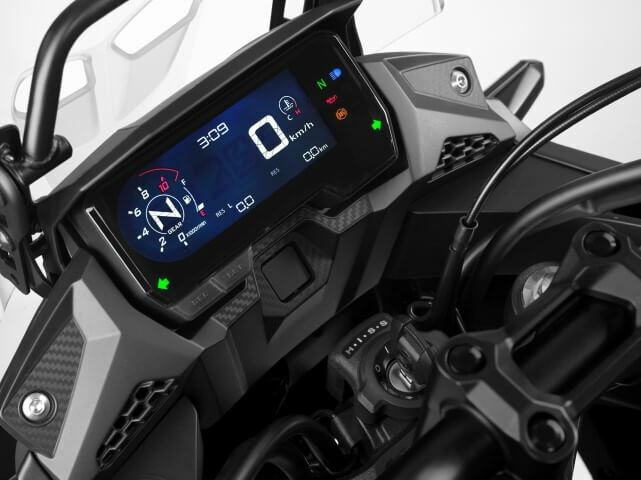 New LCD instruments – set in a multi-surfaced and textured surround, echoing the overall design theme – feature a Gear Position and Shift Up indicator; this is set to a default 8,750 RPM but can be adjusted in 250 RPM increments between 5-8,750 RPM. The tubular screen stay can also mount a GPS above the instruments. Wheelbase is 56.9 in. (1445mm) and rake and trail are set at 27.5º and 4.3 in. (108mm) giving nimble, yet confidence-inspiring steering. 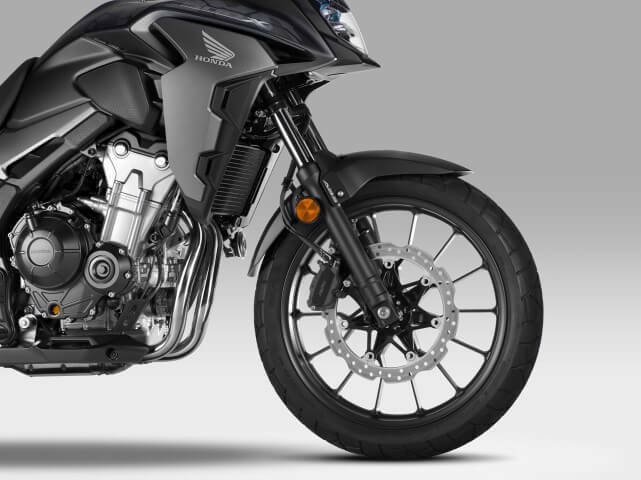 Mass centralization, with the engine in close proximity to the swingarm pivot point, delivers turning agility and optimum front/rear weight distribution ensures stability. 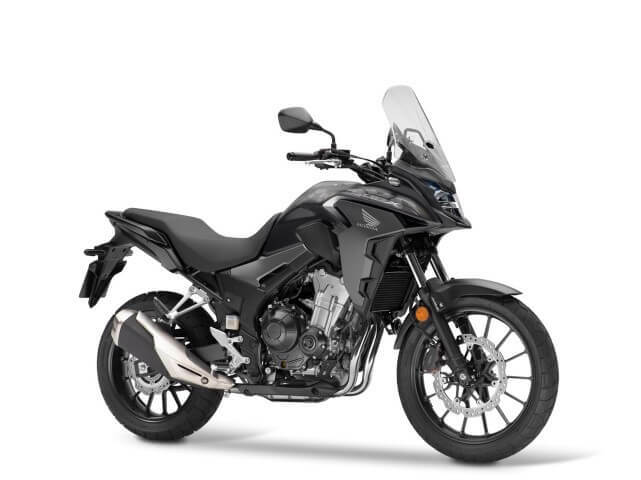 Curb weight on the 2019 CB500X 430 lbs and 434 lbs on the ABS model. Seat height is 32.7 inches (830mm); overall dimensions are 84.8 in. x 32.5 in. x 56.2 in. (2155mm x 825mm x 1410mm), with 7.1 inches (180mm) in ground clearance. 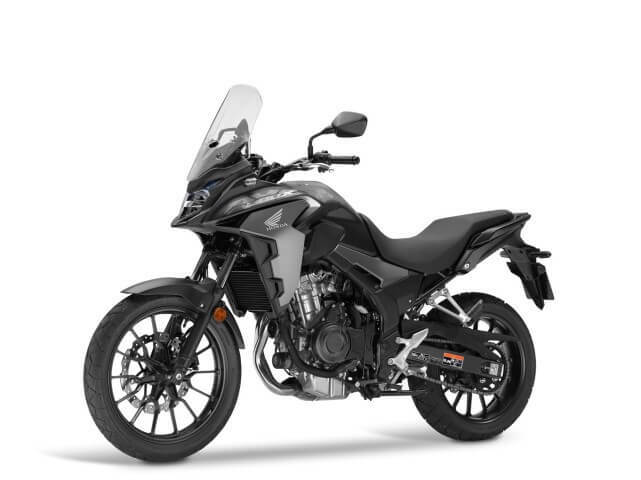 The fuel tank holds 4.6 gal (17.5L) including reserve, and combined with the engine’s excellent fuel economy of 65 MPG (27.8km/l) gives a range of over 300 miles (500km). The 41mm preload-adjustable telescopic front fork features an extra .39 inches (10mm) travel, up to 5.9 inches (150mm); rear wheel travel has been raised from 4.7 inches to 5.9 inches and a new single-tube rear shock absorber (as found on larger capacity sport bikes) replaces the double-tube design of the previous model; its large-diameter piston ensures excellent suspension response and temperature management. 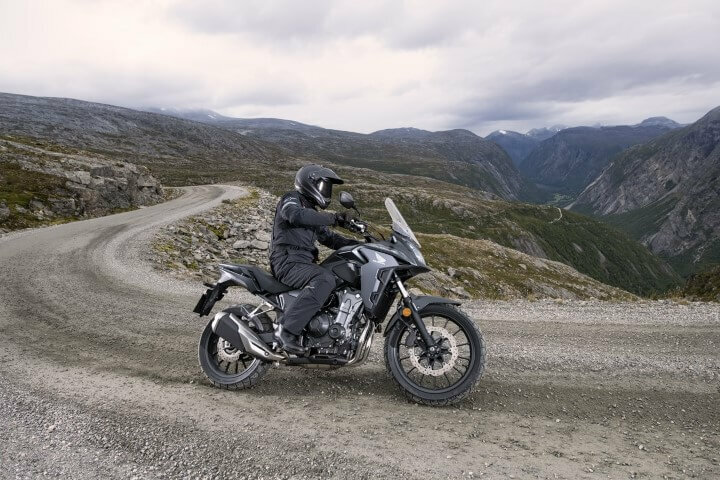 The 17-inch front wheel has been replaced with a 19-inch which – along with the longer travel suspension – ensures confident, supremely stable handling on rough surfaces. The lightweight aluminum rim wears a 110/80-19 trail-pattern tire, the 17-inch rear a 160/60-17 tire. A single front 310mm wave-pattern disc and two-piston brake caliper is matched to a 240mm rear disc and single-piston caliper. 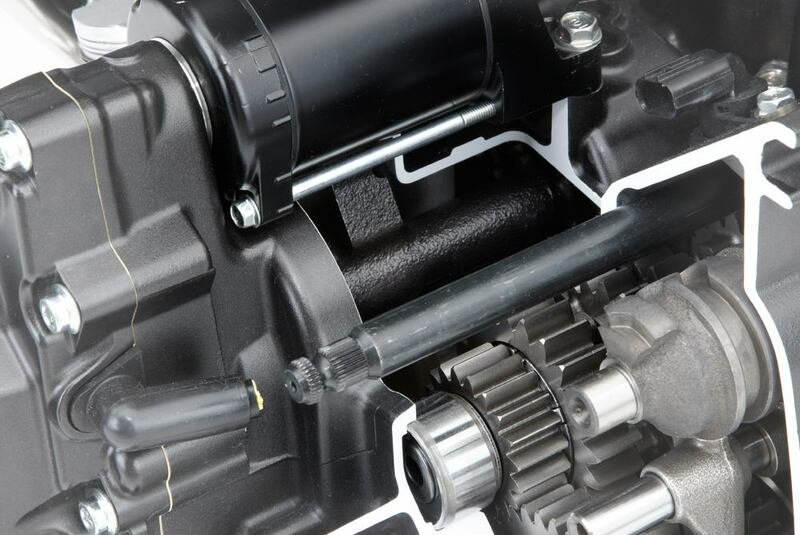 ABS is fitted as standard in parts of the world but here in the USA, you have the option to go with standard brakes or ABS (ABS = Anti-Lock Brake System). 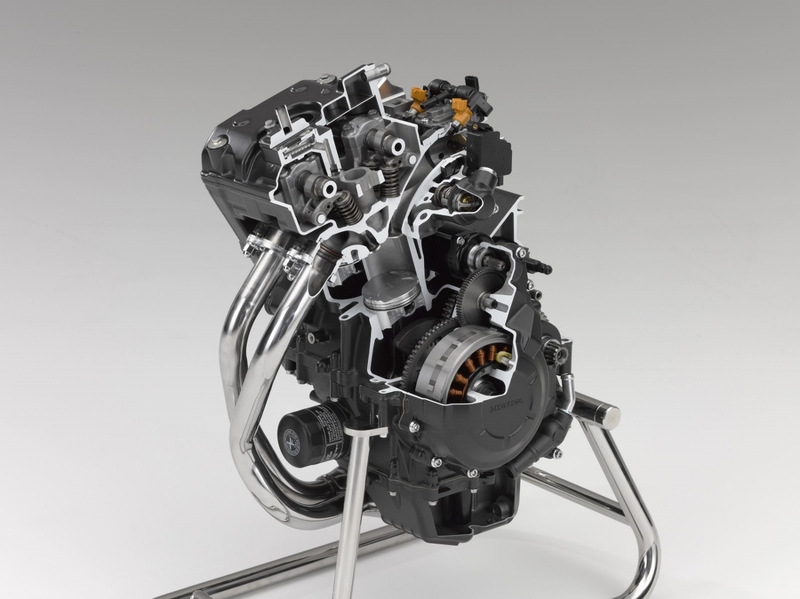 Already strong off the bottom, the target for 2019 development was faster acceleration through a boost in low-to-mid-range power and torque in the 3-7,000 RPM range; the 4% improvement comes via altered valve timing – with ‘close’ timing accelerated by 5° – and lift increased .3mm to 7.8mm. 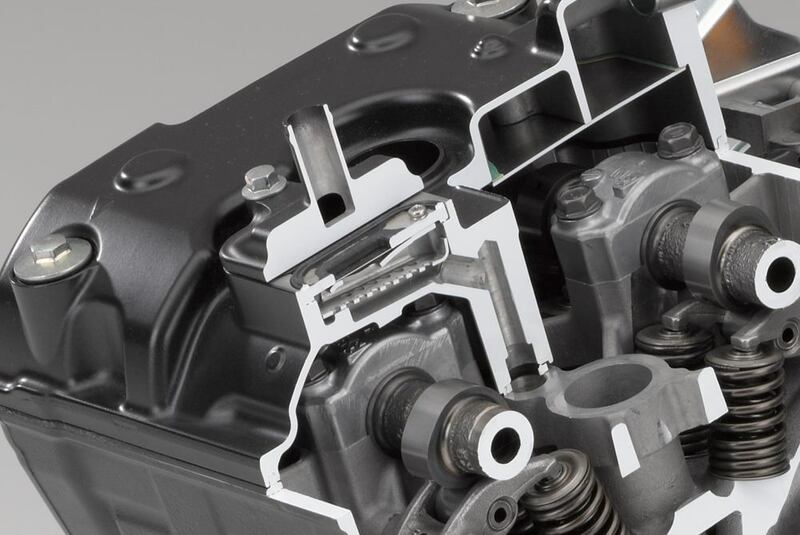 Feeding the PGM-FI fuel injection is now a more-or-less straight shot of airflow through the airbox and throttle bodies. 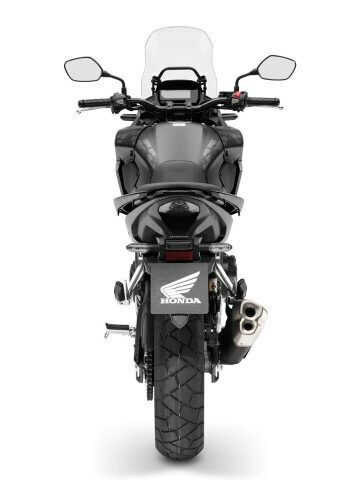 The battery has been re-positioned further away (44.1mm versus 13.4mm) from the rear of the airbox intake duct to allow greater airflow; the exhaust muffler now features dual exit pipes, adding a sportier sounding edge to each pulse. 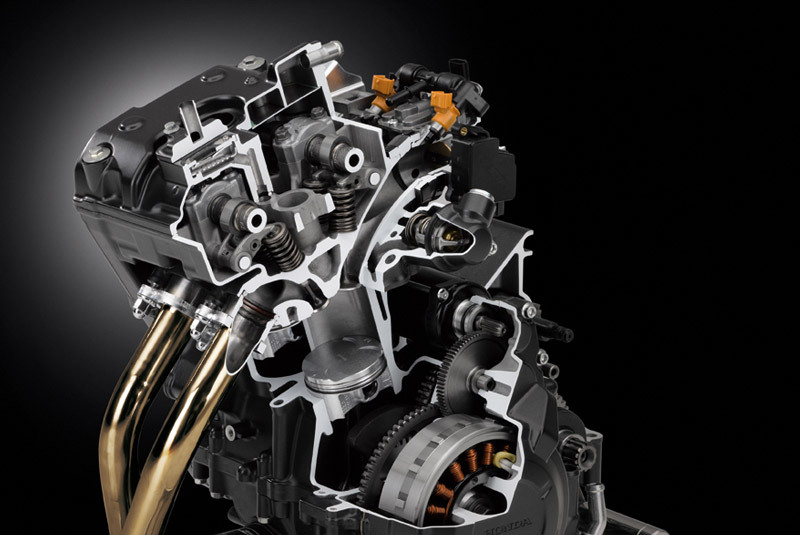 Peak horsepower of 49.6 (35kW) arrives at 8,500 RPM, with 31.7 ft/lb (43Nm) torque delivered at 7,000 RPM. 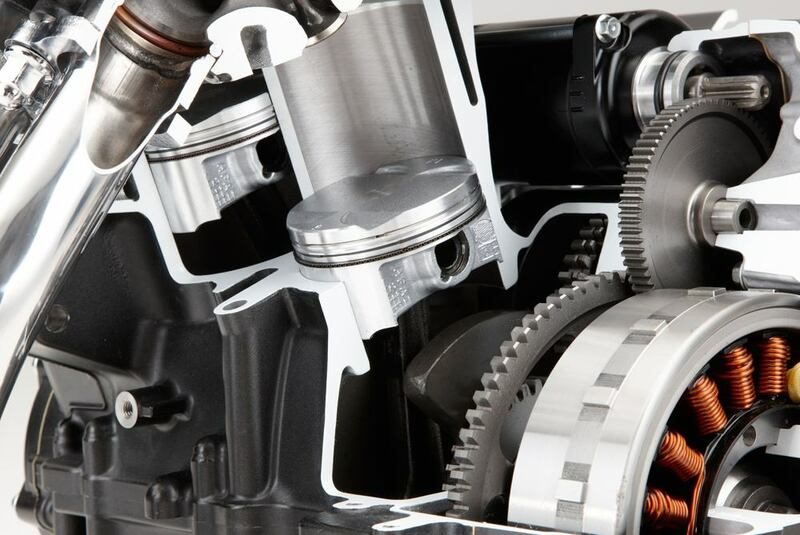 Bore and stroke is set at 67mm x 66.8mm and compression ratio remains 10.7:1; the crankshaft pins are phased at 180° and a primary couple-balancer sits behind the cylinders, close to the bike’s center of gravity. The primary and balancer gears use scissor gears, reducing noise. 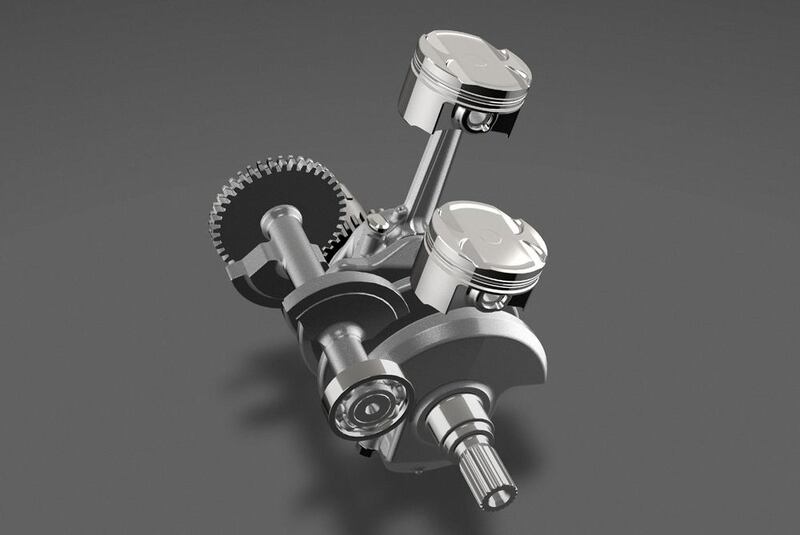 The crank counterweight is specifically shaped for couple-balance and its light weight allows the engine to spin freely, with reduced inertia. 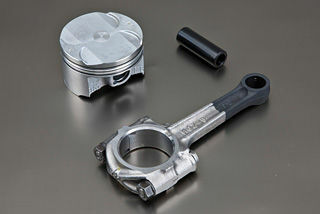 The piston shape is based upon those used in the CBR1000RR Fireblade to reduce piston ‘noise’ at high rpm. 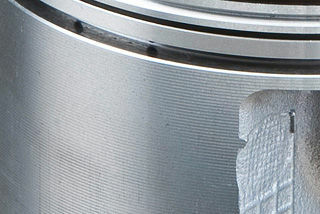 Friction is reduced by the addition of striations on the piston skirt (a finish that increases surface area, introducing gaps in which oil can flow for better lubrication). 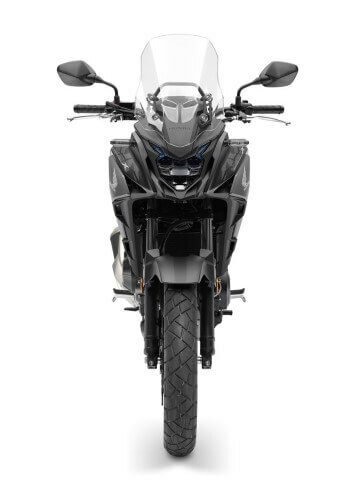 As with the CBR1000RR, an AB 1 salt bath process, used after isonite nitriding, forms a protective oxidization membrane. 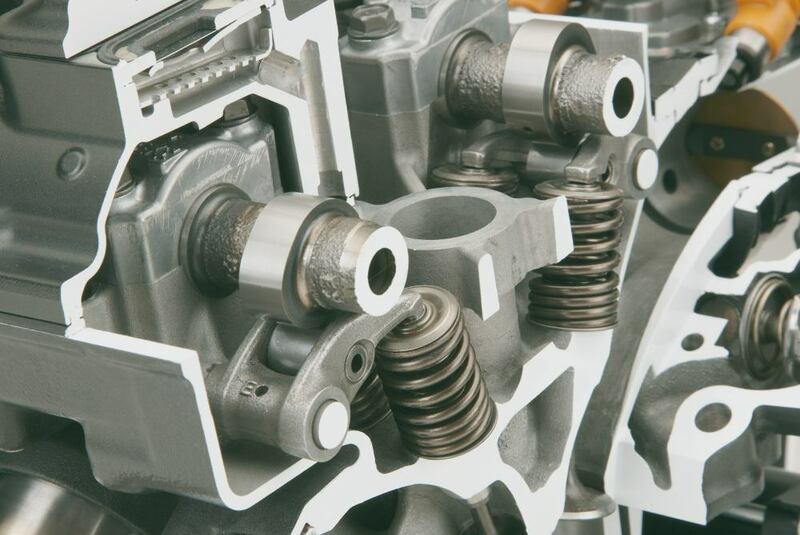 The crankcase uses centrifugally cast thin-walled sleeves; their internal design reduces the ‘pumping’ losses that can occur with a 180° phased firing order. 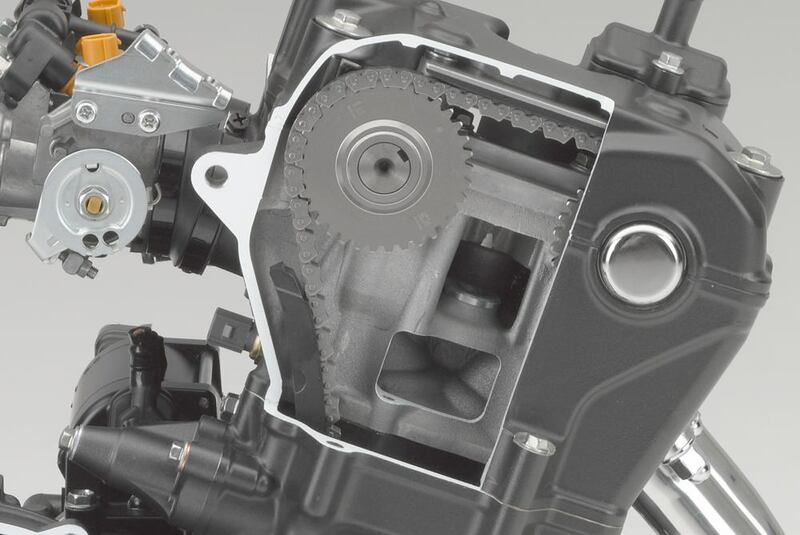 Using the same internal relief structure as that of the CBR1000RR, the oil pump features improved aeration performance, with reduced friction; a deep sump reduces oil movement under hard cornering and braking. Oil capacity is 3.4 qt. * Includes all standard equipment, required fluids and full tank of fuel—ready to ride Meets current EPA standards.